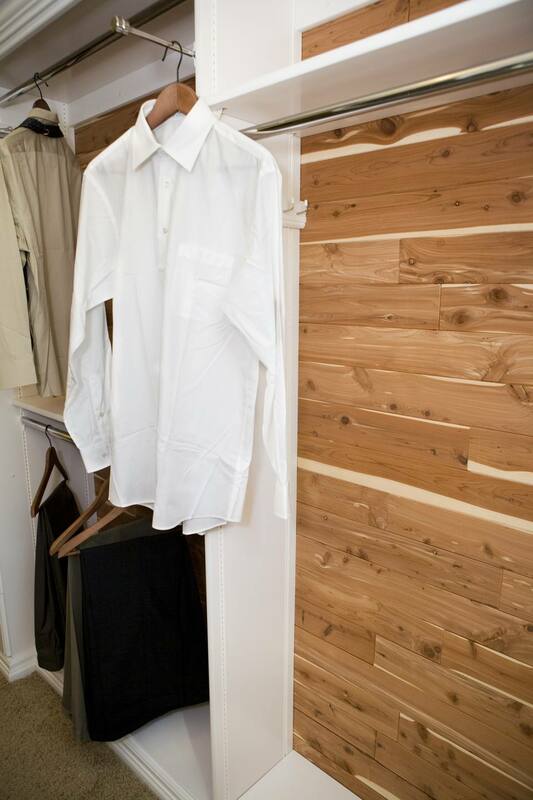 Lining a closet with cedar planks or panels is a traditional method of dressing up a closet and is widely believed to repel moths, roaches, silverfish, and other insects that can damage clothing. The jury is out on whether cedar actually wards off bug (some people believe that cedar merely masks the smell of the wool that moths like to feed on, acting as a deterrent, not a repellant). But there is little dispute over the fact that cedar can lend a very pleasant odor to a closet. Turning your closet into a cedar closet is easy to do with any of the following materials. Also called flakeboard or chipboard, wafer board is a panel made of compressed chips and flakes of cedar. This is the least expensive option and also the least attractive. The panels are 1/4 inch thick and are available in 4 x 8-foot and 16 x 48-inch sheets. The panels can be either nailed to the wall or attached with adhesive. Panels should be gapped 1/8 inch or more, to allow room for expansion. You can cover the gaps with solid-cedar molding strips or leave them uncovered. A large panel costs about $25, which means that you could cover a typical 8-foot-wide closet for just $75 in panel costs. Because these panels aren't all that attractive, this is a good option where you're not terribly concerned about appearance. Solid-wood cedar planks come in kits designed for closet installation. They create a much more attractive closet than wafer board panels. The 1/4-inch thick planks have tongue-and-groove edges that fit together for a finished look. The planks are installed with nails driven into the tongue of each piece; the groove of the next plank fits over the tongue and hides the nail heads. Plan to spend about $2 to $2.50 per square foot for the planks. This makes solid wood the most expensive option, but it also provides the nicest appearance, and usually the nicest smell. Plywood panels with a surface veneer of cedar are moderately priced and install as easily as wafer board panels but look more like solid cedar wood, making plywood a good compromise between the two. Panels typically are 1/4 inch thick and come in 4 x 8-foot sheets. The face of the panel is made with thin veneers of real cedar bonded to a plywood core (usually made from other types of wood). The veneer material is cut into strips about 5 to 6 inches wide to mimic tongue-and-groove planks. Cedar plywood can be installed with nails or adhesive and costs about $32 for a 4 x 8-foot panel, or about $1 per square foot. Gluing panels of plywood or wafer board to a wall is a bit easier than nailing them, but keep in mind the gluing is a more permanent installation method. Once the panels are stuck to the wall, they can't be removed without tearing much of the drywall's face paper (whether the drywall is painted or not). This can be repaired in many cases, but it's a time-consuming and sometimes difficult process. With a nail-only installation, removing panels leaves only some nail holes to patch in the drywall. What is the Best Way to Choose Driveway Pavers?